K-means clustering is one of the simplest and popular unsupervised machine learning algorithms. Typically, unsupervised algorithms make inferences from datasets using only input vectors without referring to known, or labelled, outcomes. A cluster refers to a collection of data points aggregated together because of certain similarities. You’ll define a target number k, which refers to the number of centroids you need in the dataset. A centroid is the imaginary or real location representing the center of the cluster. Every data point is allocated to each of the clusters through reducing the in-cluster sum of squares. In other words, the K-means algorithm identifies k number of centroids, and then allocates every data point to the nearest cluster, while keeping the centroids as small as possible. The ‘means’ in the K-means refers to averaging of the data; that is, finding the centroid. The centroids have stabilized—there is no change in their values because the clustering has been successful. The defined number of iterations has been achieved. Let’s see the steps on how the K-means machine learning algorithm works using the Python programming language. 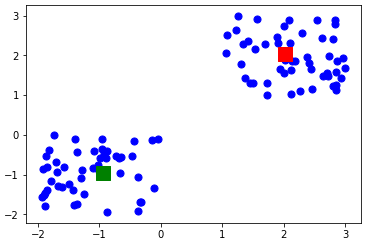 We’ll use the Scikit-learn library and some random data to illustrate a K-means clustering simple explanation. A total of 100 data points has been generated and divided into two groups, of 50 points each. We’ll use some of the available functions in the Scikit-learn library to process the randomly generated data. In this case, we arbitrarily gave k (n_clusters) an arbitrary value of two. Let’s display the cluster centroids (using green and red color). Here is the code for getting the labels property of the K-means clustering example dataset; that is, how the data points are categorized into the two clusters. As you can see above, 50 data points belong to the 0 cluster while the rest belong to the 1 cluster. It shows that the test data point belongs to the 0 (green centroid) cluster. K-means clustering is an extensively used technique for data cluster analysis. It is easy to understand, especially if you accelerate your learning using a K-means clustering tutorial. Furthermore, it delivers training results quickly. However, its performance is usually not as competitive as those of the other sophisticated clustering techniques because slight variations in the data could lead to high variance. Furthermore, clusters are assumed to be spherical and evenly sized, something which may reduce the accuracy of the K-means clustering Python results. What’s your experience with K-means clustering in machine learning?